Known as “Vilas Operárias”, these types of look-a-like houses planned for the working class, are some of the most peculiar forms of tenement buildings from the industrial period – hidden pearls in the old town of Lisbon. Agapito Fernandes, Galician born, arrived in Lisbon from Redondo, Pontevedra with money in his pockets and a head full of ideas. He decided to invest in a factory which produced biscuits for the military and a luxury restaurant in the heart of Lisbon, a place for the rich classes: politicians and entrepreneurs. He also decided to build a quarter for his workers with controlled rents. It was finished in 1909 from the plans of architect Norte Junior. It had a family house in the center and was surrounded by small houses with iron ladders and balconies for the factory workers. There’s a strong symbol visible everywhere: a five-pointed star. Some said Agapito had a hair whorl, a crown on top of his head, while others claim he was a member of the mysterious Freemasons. The quietness of the quarter is impressive and for a few moments one can be elsewhere, far from the busy town. 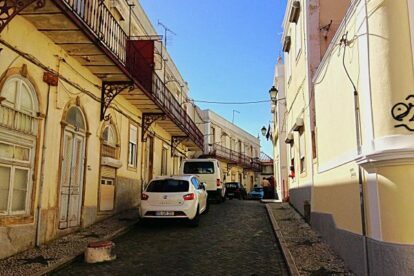 Inside the quarter, located near Rua da Graça and planned for 120 families was a chapel, a school and near it a cinema, the Royal Cine, the first to screen a movie with… (wait for it!) sound: “White Shadows in the South Sea”. Take a walk inside the building as it’s still in use, now as a supermarket chain.